We love the Nobel Foundation and how its awards celebrate the greatest achievements by, and for, humankind. But there’s one thing we do not love: the Foundation’s investments in the fossil fuel industry are driving climate change. That’s why we call on the Nobel Foundation to take moral leadership and cut all its ties to the climate wrecking fossil fuel industry. 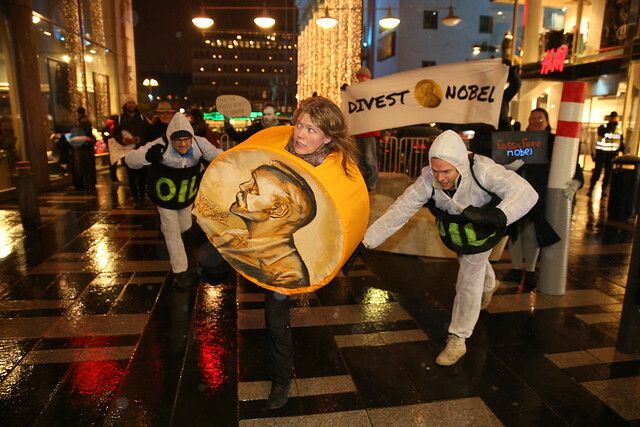 20 Nobel laureates have joined the call urging the Foundation to divest. Read their open letter here. What do you have against the Nobel Foundation? We actually really love and respect the Nobel Prize. Our aim is to get large institutions to publicly announce that they are taking a moral stand against fossil fuels, thus taking away a piece of their social license to operate. …but why Nobel then as opposed to any other institution? Nobel is seen by the public, and politicians (and us! ), as a guiding light, showing the way forward for humanity. As such, we do not believe investments in fossil fuel companies, which are fuelling the climate crisis, are compatible with the foundation’s core aim: to bestow prizes upon those whose work is of the greatest benefit for mankind. Why not just go directly for the fossil fuel companies? Wouldn’t that be more effective? The nature of the international funding of fossil fuel companies is a complicated web. Divestment is a tool which has proven successful in other movements such as the anti-apartheid movement, and anti-tobacco. What is wrong with the fossil fuel industry? We all live in the fossil fuel era, but it needs to come to an end, and soon – before more irreperrable damage is done to our world. Fossil fuels are the main driver of climate change, and other major catastrophes for society, such as oil spills, air pollution, contaminated drinking water from fracking, etc. Moreover, companies like ExxonMobil are facing charges for having deliberately misled the public, shareholders and governments over climate change science for decades to protect their profits. But if it’s not a lot of money, will it really have an impact on the fossil fuel industry? First of all, there is currently no limit on how much the Nobel Foundation could place in fossil fuels – and who would keep track of it? The sum could increase at any time, actually without Nobel Foundation knowing themselves since funds have long lists of companies invested. Secondly, what we’re looking for is for the Nobel Foundation to take a moral stance against the fossil fuel industry, and to encourage others to do so. Nobel as a moral authority makes this about much more than a number.